On Saturday, October 22, a small group of JASNA Hawai`i members met at the home of Paula Nakayama for a Jane Austen Trivia Tea. 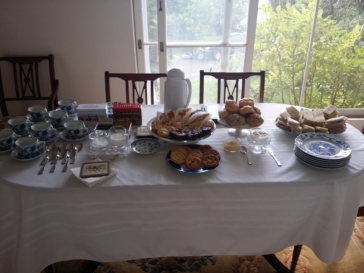 Paula provided a wonderful tea buffet (see above), and we had some fun playing various trivia games revolving around Jane Austen's life, her novels, and her characters. Mahalo to Paula for her generosity in hosting this event. Our next event will be a "Belated Birthday Tea" some time in early 2017 at a location to soon be determined. Stay tuned for further details.